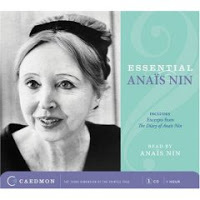 Essential Anaïs Nin CD: Excerpts from her Diary and Comments (Caedmon Essentials) [ABRIDGED] [AUDIOBOOK] (Audio CD Just out. Anaïs Nin Author/ Anaïs Nin Narrator. Order using our Anaïs Nin Amazon Bookstore Link.